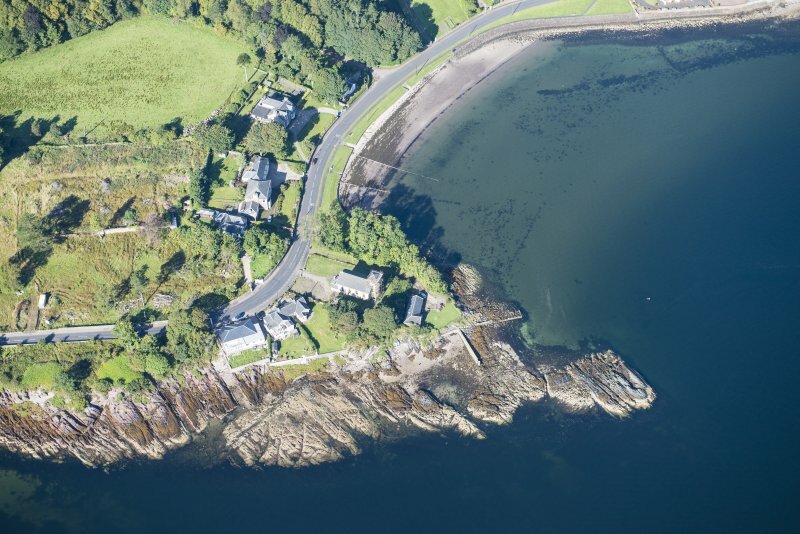 Oblique aerial view of Ascog Point, looking W.
This site falls within the Ascog Area of Townscape Character which was defined as part of the Rothesay Urban Survey Project, 2010. The text below relates to the whole area. The largely linear, dispersed settlement of Ascog lies along the main coastal road out of Rothesay. The earliest remaining evidence of settlement here is Ascog House, a typical late 17th century laird’s house dating from 1678, the Ascog Estate originally being part of the Mount Stuart holdings. The remains of an 18th century salt pan survive in Ascog Bay, though there is some doubt whether it actually went into production. Development in the area is restricted to the coastal strip, with the rocky Hill of Ascog preventing the settlement spreading further inland. The settlement mostly dates from mid- to late 19th century, when it became a popular destination for a number of prominent Glasgow industrialists and merchants: civil engineer, Robert Thom (Meikle Ascog, c.1840), Alexander Bannatyne Stewart, Convenor of Bute and prominent in the Glasgow Merchant City (Ascog Hall and Fernery, c.1844-70), shipbuilder ‘Mr Ferguson’ (Millbank House, 1825-63) and Mr Thomas Croil, wealthy West India Merchant (Balmory House, 1861). As a result, most of the properties are large detached Victorian houses set in fairly extensive grounds. The Church, designed by James Hamilton and built in 1842-3 on the little promontory beside the former salt pan, has a three-stage Italianate belfry at the rear, which adds interest to what is essentially a fairly plain and simple structure. This was the first permanent church building of the newly formed Free Church of Scotland to be built in Scotland. Other significant buildings include the former Agnes Patrick Home and adjacent Stevenson School, which were established in 1900 by Bute philanthropist Agnes Patrick to provide a fortnight’s ‘fresh-air’ holiday for under-privileged children from Glasgow. Girls were housed in the Agnes Patrick Home (now Chandlers’ Hotel) and boys in the Stevenson. The majority of the other buildings in Ascog are later examples of the Victorian tourist trade which saw the huge expansion of Rothesay town to the extremities of Port Bannatyne in the north and Ascog in the south by industrialists and merchants from the mainland wishing to have a home from home in Rothesay. There has been little further development in this area since the decline of the tourist trade, with just a few late 20th and early 21st century houses built within the grounds of the former mansions. There are just a handful of houses built on the shore side of the main road in the Ascog Area of Townscape Character, which is unusual for Rothesay, where almost all of the development is on the landward side of the coastal road from Port Bannatyne to Ascog. As suggested above, there has been little change in the overall layout and character of the Ascog Area of Townscape Character since the early 20th century. The area retains its semi-rural character due to the dispersed, relatively unplanned layout. A mix of building styles still exists with Ascog House providing a fine example of a late 17th century laird’s house, particularly since its restoration, along with Meikle Ascog (Robert Thom, c.1840), by The Landmark Trust in the 1990s. Elements of the Scottish vernacular building tradition exist with the crowstepped gables and the whitewashed rubble which has been reinstated. Building styles elsewhere in Ascog Area of Townscape Character are, on the whole, typical stone-built Victorian villas, though the Agnes Patrick Home (now Chandlers Hotel) is of mock half-timbered ‘English’ style, which can be seen elsewhere in Rothesay in the cluster of six houses by William Hunter on Ministers Brae in the East Bay and Serpentine Area of Townscape Character. Modern development has kept to the general proportions of existing development, being large detached houses set in large garden plots. This has usually meant a reduction in plot size for the original houses, but still retains the open, low density character of the Ascog Area of Townscape Character.